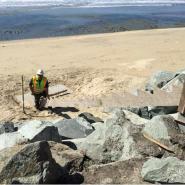 HALF MOON BAY – When it comes to projects that improve the environment and help others enjoy our natural surroundings, the Graniterock Construction Division feels they'resecond to none. 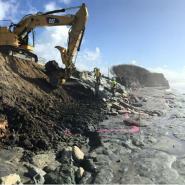 The Construction team recently wrapped up a rock slope protection project at Surfer’s Beach in Half Moon Bay, which enhances coastal access and recreation along a 175-foot stretch of eroding bluff. 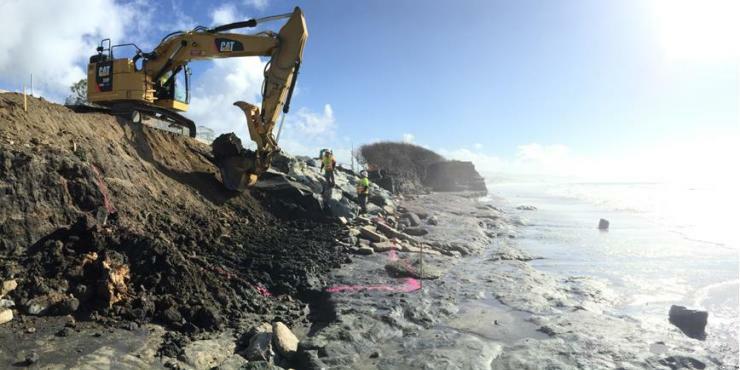 The $850,000 Caltrans job on Highway 1, won by Estimator Rob Snyder and led by the project management team ofKyle McLean and Matt Wadiak, involved installing 1,000 tons of rip rap and 1,000 tons of a smaller rock about the size of a basketball to slow erosion from the ocean. The work also included a new staircase for public access to the beach and paving a 400-foot section of pedestrian trail to connect to the existing California Coastal Trail north and south of the site. The team also picked up a culvert emergency repair job for Caltrans while building this project. Much thanks goes to the team: Kevin Jones,Josh Armer, Mark Hurley,Alissa Miller, Dave Duckworth, Monique Washington, Brad Croft, Jesus Belmontes, Pablo Ramirez and Jorge Olivares.